Polar vortex 2015: It’s so cold, even Minneapolis is canceling school. A woman tries to stay warm as she waits on an L platform during the early morning rush. 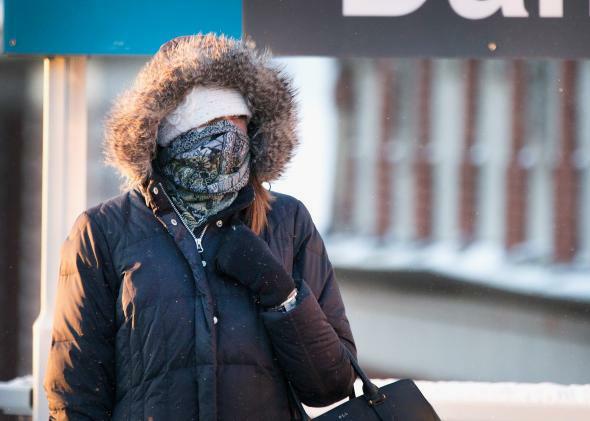 Temperatures hovered around zero degrees Fahrenheit on Jan. 7, 2015, in Chicago. Minneapolis public schools are closed today thanks to a record-setting Arctic high-pressure system that boasts wind chills exceeding 50 below zero. Schools are also closed today in Chicago, which will spend most of the day mired below zero. Minnesota schools in particular are famously hardy—here’s the map to prove it. But last January, during the infamous polar vortex, schools were closed five times in the Twin Cities. If it makes you feel any better, you can blame the polar vortex this time around, too. A similar destabilization of the polar vortex is contributing to this year’s intense cold air outbreak, though it’s not expected to linger nearly as long. A few days ago, a lobe of the stratospheric polar vortex detached from the main circulation over Siberia, and shifted toward central Canada. That eddy of Arctic misery is now helping push cold air toward the eastern United States. An atmospheric trajectory model shows Thursday’s cold air in Chicago will be sourced from northern Greenland. In addition to the stratospheric perturbance, the cold air and bitter winds are coming thanks to a record-setting high pressure system centered over Nebraska that’s helping to funnel cold air southward from as far away as Greenland. Omaha has already set an all-time high-pressure record today, with other nearby cities like Sioux Falls, South Dakota, and Topeka, Kansas likely to follow. The last day with pressure this high in the plains states was nearly 110 years ago: Jan. 25, 1905. High pressure during the winter is often associated with cold air, clear skies, and stronger-than-average winds. The cold weather will peak Thursday morning as it shifts eastward. The high temperature in Chicago (recorded at midnight Wednesday morning) was just 6 degrees Fahrenheit at O’Hare Airport, and it’ll get chillier throughout the day. The temperature won’t rise above 14 degrees there until Sunday, with a near-record low of 10 below anticipated on Thursday morning—around the time the temperature will dip into the single digits in New York City, Boston, Philadelphia, Baltimore, and the western Washington, D.C., suburbs. But, as with last winter’s polar vortex, the biggest story is how far south the cold air will get. If you factor in the wind chill (which it’s totally fair to do on days like this), it’ll feel like it’s near zero all the way down to the Gulf Coast. Heck, even places like Tampa, Florida, and the very tippy tip of Texas—which is practically tropical—will have sub-freezing wind chills on Thursday morning. Sadly, for all the cold, there won’t be much snow to show for it outside the lake-effect zones of the Great Lakes. Thanks to the abnormally high pressure, there just isn’t much moisture to work with in the atmosphere. A recent study by Climate Central showed that, despite its prevalence in recent winters, days with extreme cold are in a long-term decline in the United States, linked to ongoing global warming. 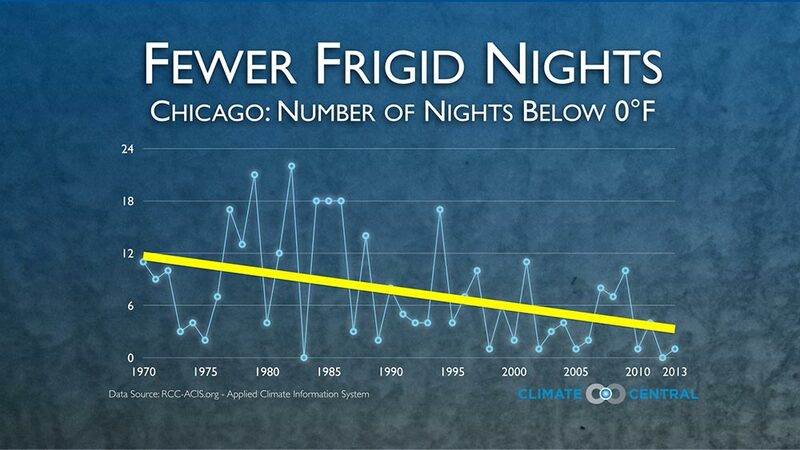 For example, in the 1970s, Chicago used to see about 10 nights per year dipping below zero. Since 2000, the average is less than five.